If everyone's favorite psychiatrist-turned-radio host returns to the small screen, one thing is for sure — it won't be more of the same. It's been nearly 15 years since Frasier Crane bid one last "Good night, Seattle" to his listeners, but the man who brought that character to life hopes his fans will soon have the chance to say hello to "Frasier" again. During a Monday night visit to "The Late Late Show," Kelsey Grammer opened up about the much buzzed-about reboot that — for now, at least — remains "in talks." As for who he and would-be producers are talking to, he simply said that it's "a group of writers" tasked with finding the right hook to make a revival make sense. "The first principle is that it is a different story, basically," he told host James Corden of their goal. "Same group of characters, but in a different setting. Something has changed in their lives." One obvious change would involve a member of the beloved ensemble who can't return — late stage and screen actor John Mahoney, better known to viewers as the gruff patriarch Marty Crane. "Certainly John Mahoney died over a year ago and we would probably deal with that a little bit, with dad being gone," Grammer noted. While he's still not certain exactly what a "Frasier" revival would entail, the star knows what it won't entail — seamlessly carrying on with the same plot. In other words, this isn't "Frasier — Part 2" that he's talking about. The star, who first played the character on "Cheers" in 1984, envisions this as "the third act of 'Frasier,' rather than trying to pick it up, like 'Will & Grace' did, right where they were." "We’re just exploring what that might be," he explained. "It could be in Chicago — he left for Chicago before in the last episode of 'Frasier.'" Kelsey Grammer and Lauren Rogen talk about 'Like Father' and possible 'Frasier' reboot! But when asked if the leading man would still be "listening" to radio callers in need of help, he nixed that idea. 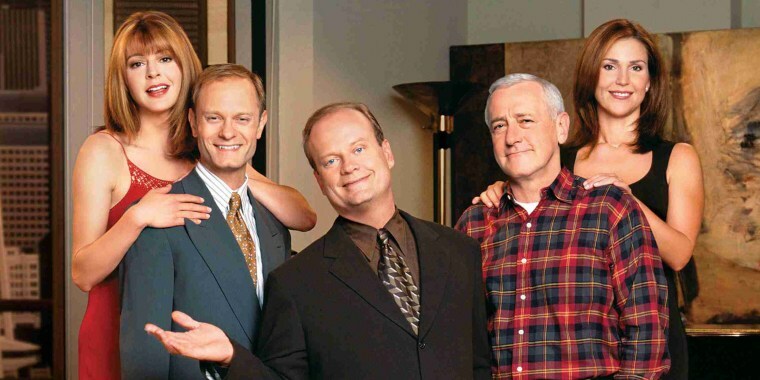 Whenever or however "Frasier" comes back, Grammer knows "there seems to some appetite for it." And if he had any doubts about that, cheers from Corden's audience put them to rest.